It's time for 5QF! YAY! 1 - What were your school colors? 2 - What's the best compliment you've ever received? Hm...I'm not sure. I will have to think about this one! I do get told i look like Reese Witherspoon a lot & that one's nice! I have gotten some really kind ones regarding either acting/singing or my character, but i can't recall a specific one right now! 3 - Do you buy cheap or expensive toilet paper? Middle? I hate cheap TP - it doesn't feel too great on the tush! I think we normally get Angel Soft - which is not that expensive at all. 4 - Have you ever had a surprise party thrown for you? Or have you thrown one for someone else? I have never had one thrown for me...I always plan my own parties, haha. I love surprises, though - as long as i have NO CLUE in advance. If i found out, i would hate it b/c then i'd have to pretend to be surprised...awkward! I have thrown a few surprise parties. So much fun! The best one is when we threw my friend Kristin a surprise going away/birthday party. She was going to study in Italy for a year or something crazy. Anyway, i took her to dinner while my roommates were decorating the house & setting up for the party. There was some reason why she was coming by our house after dinner. We were on our way back & i had called the house to tell them we were on our way (we were in separate cars). Well, we get there & TONS of people are inside waiting to shout surprise. I get out of my car, Kristin gets out of hers & she was like, "Mel! Will you ride back with me to the end of Brightside? They had a GORGEOUS sunset & i wanna go take a picture of it!" HA! Leave it to Kristin! I said, "Um, sure...but i really have to pee first! Real quick?!" So we ran in & "Surprise!" I hope she didn't mind about not getting a pic of that sunset! LOL! 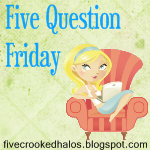 5 - What is one "material" possession you just can't live without? My camera. It's just a little point & shoot but i would hate it if i couldn't take pics!! Fun! Thanks for sharing have a great weekend!! LOL that's the first thing I thought when I saw your picture is that you look like Reese!! Haha, that's funny about the sunset! That sounds like so much fun, I've never been to a suprise party like that!! Reese Witherspoon is pretty. That's a great compliment!